Congratulations to Jessica and Mike, married May 28, 2011! These two were married at the Cathedral before their beautiful Metropolitan Terrace reception. We LOVED Jessica's dress and their simple white color palette. Plus, isn't it good luck to have rain on your wedding day? We think so! Thank you Doug for these lovely photos! Congratulations to Lesley and Joe, married on May 29th, 2011! We loved their bright spring colors and fun, creative details. How cute is that last picture? Thank you Kris for these awesome photos! Congratulations to Lauren and Laurence (say that three times fast), married on June 3, 2011 at The Citizen Hotel! L & L enjoyed a Metropolitan Terrace ceremony and reception, with a quick break for hors d'oeuvres in Scandal in between. We think they make quite the stunning couple, don't you agree? Thank you Shellie for these beautiful photos! Congratulations to Whitney and Kyle, married May 22nd at The Citizen Hotel! From Stout Photography: He lived in Canada. She lived in the US. They met in Europe. Their circumstances weren’t exactly ideal, logistically; but Whitney and Kyle knew they’d found something rare that simply could not be ignored. With the help of Skype, Facebook, and frequent-flyer miles, Whitney and Kyle managed to defy the odds and make a long-distance relationship not only work, but thrive. 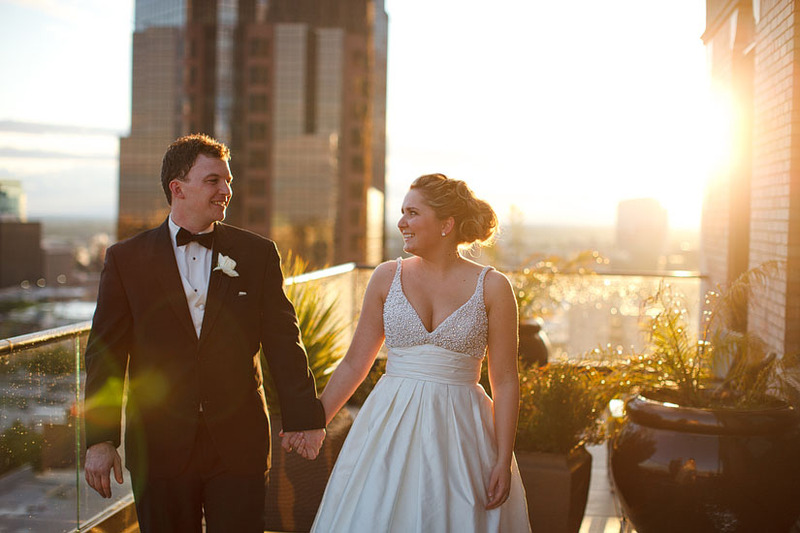 They married at the fabulous Citizen Hotel in Downtown Sacramento. Whitney used a very simple but elegant color pallet; white black and golds and it came together beautifully. No detail was spared and the wedding was absolutely gorgeous. We have to agree! This wedding was so beautiful, it was recently featured on Style Me Pretty! Click here to read the feature. Congratulations to Kristin and Brian, married May 13th at The Citizen Hotel! Kristin and Brian technically met in high school (him: a freshman / her: a senior), but were reacquainted a few years later over drinks at a bar. In Kristin's words, "Our first date we went on a long drive where I discovered he was more than just a pretty face." Five months later, Brian proposed to Kristin in prison. Well, sort of. He proposed to her on Alcatraz, with a gorgeous view of the city and the Golden Gate Bridge behind them. It was a fitting scene, seeing as how they both share a dark sense of humor. After all, they got married on Friday the 13th! The best part of their wedding day? Sneaking away to enjoy a few Kobe sliders before the reception began. Kristin took one bite of her slider and her dress RIPPED all the way up the back. Beth and Sarah (the photographers) ran to go get help, leaving Kristin and Brian completely alone, laughing hysterically. In Kristin's words, "We looked at each other, and even though my dress was ripped up the back and my Spanx were showing, we started laughing. We were completely alone and it was super quiet and we looked at each other and realized that we were MARRIED. It felt like the universe's way of giving us a quiet moment alone together to just take it all in! I will always remember that moment alone with Brian." We loved hearing Kristin's reaction to what most brides probably would have cried over (and rightfully so!). 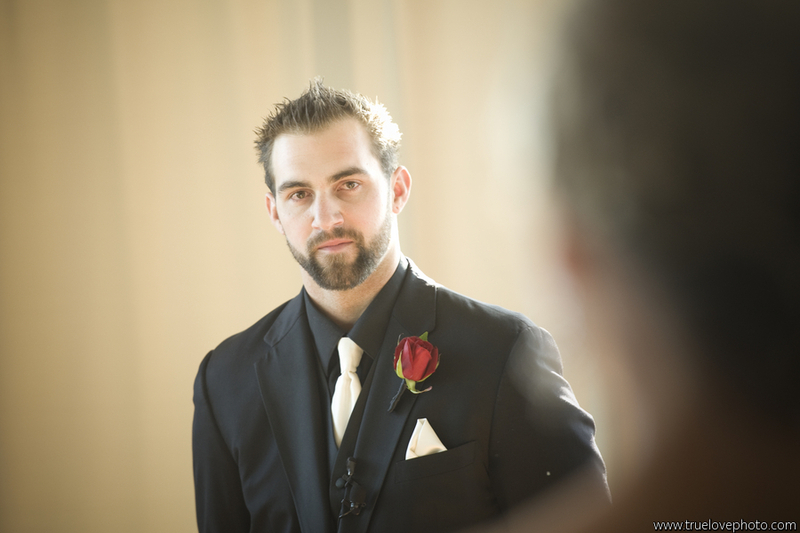 Luckily, Matt of Extreme Productions swept in as Wedding Superhero and saved the day with his mad sewing abilities. Thank you Kristin for sharing your special day with us, and thank you to Beth for these amazing photos! 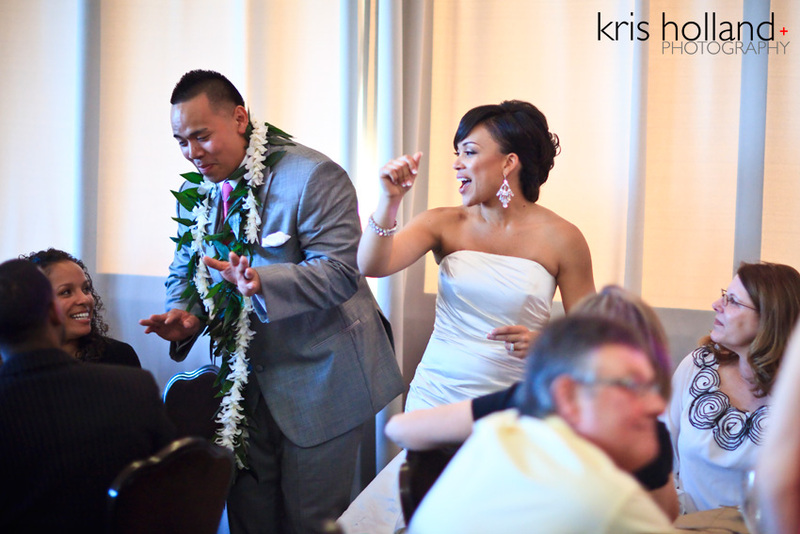 Congratulations to Tanoa and Allen, married on May 20, 2011! We loved all of their jeweled details, and how beautiful is that three-tiered cake? Thank you Lyndsay for these gorgeous photos! Congratulations to Jeannie and Raymond, married May 15, 2011 at The Citizen Hotel! This beautiful couple said "I do" in our Plaza Park Ballroom before heading up to the Metropolitan Terrace for dinner and dancing. Their guests loved "smooshing" in the Smoosh Photo Booth! Thank you Darrell for these awesome photos! Congratulations to Justin and Elizabeth, married March 27, 2011 at The Citizen Hotel! This sweet couple got married on our Metropolitan Terrace and enjoyed a cocktail hour in Scandal Lounge while we flipped the room for the reception. We loved their soft neutral color palette, perfect for a spring wedding! Thank you Jen and Chris for these fabulous photos! 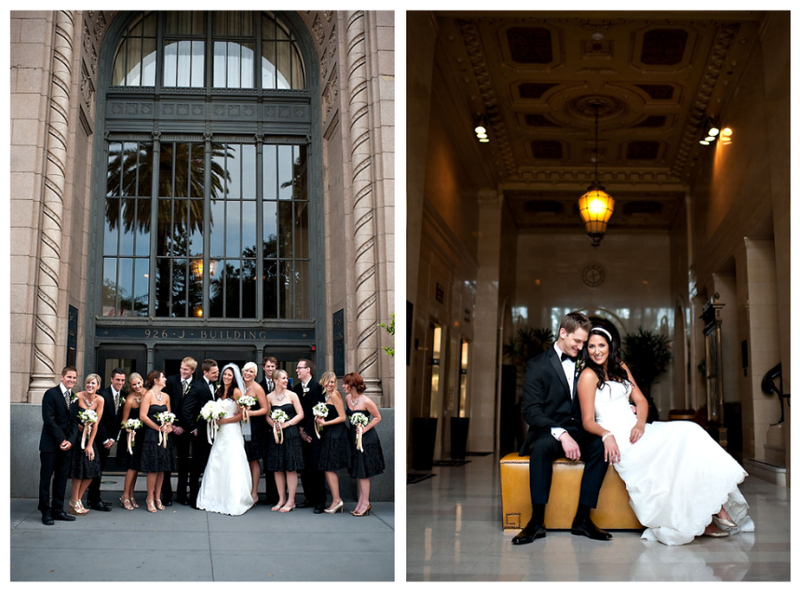 Congratulations to Gina and Rhett, married on February 12, 2011 at The Citizen Hotel! We loved every detail of this beautiful wedding, especially the classic pops of red. And how perfect is the light in every photo?! Beth you never cease to amaze us! Thank you for these gorgeous pictures! Congratulations to Kimberly and Ken, married September 18, 2010 at The Citizen Hotel! Ken was one stud of a groom, and we LOVE those iPhone cuff links! Kimberly and Ken were married during the day on our Metropolitan Terrace before heading to Rice Bowl Restaurant for their reception. Thank you Deborah for these beautiful photos! Congratulations to Katie and John, married December 31, 2010 at The Citizen Hotel! Looking for an awesome way to ring in the new year? This couple ROCKED a New Years Eve wedding, complete with dancing, champagne toasts, and fireworks! Thank you Geoff and Lisa for these beautiful photos! Congratulations to Annie and Troy, married May 30, 2010! This beautiful couple enjoyed one of the most festive wedding celebrations we have ever seen! Smiles all around, the room was filled with love for these two. Sarah Maren captured the night beautifully--make sure you watch the slideshow on her website for more amazing photos. This wedding was even featured on Style Unveiled! And yes, those are sparkly Jimmy Choos in the first picture. We're jealous as well. Congratulations to Carrie and Wendy, married November 13, 2010 at The Citizen Hotel! We loved their red color scheme, the sequin converse shoes, and of course, the gorgeous dessert display. Thank you Beth for these beautiful photos! 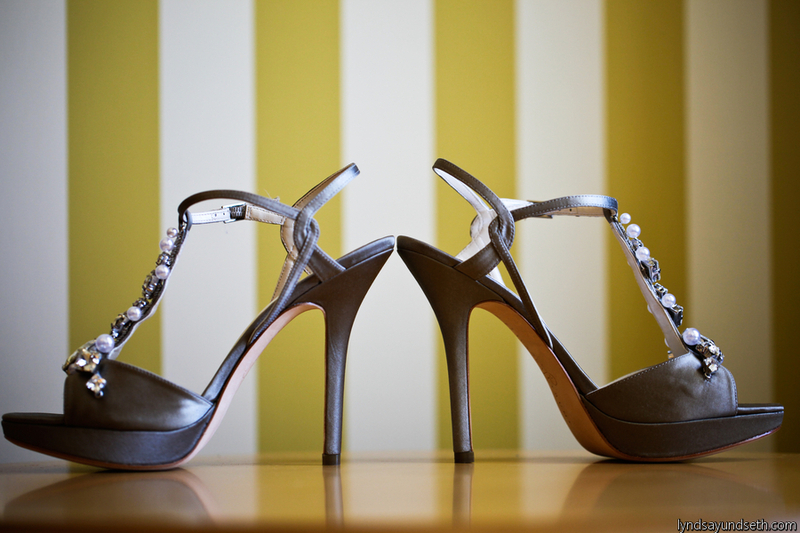 Congratulations to Angie and Nathan, married on March 12, 2011 at The Citizen Hotel! 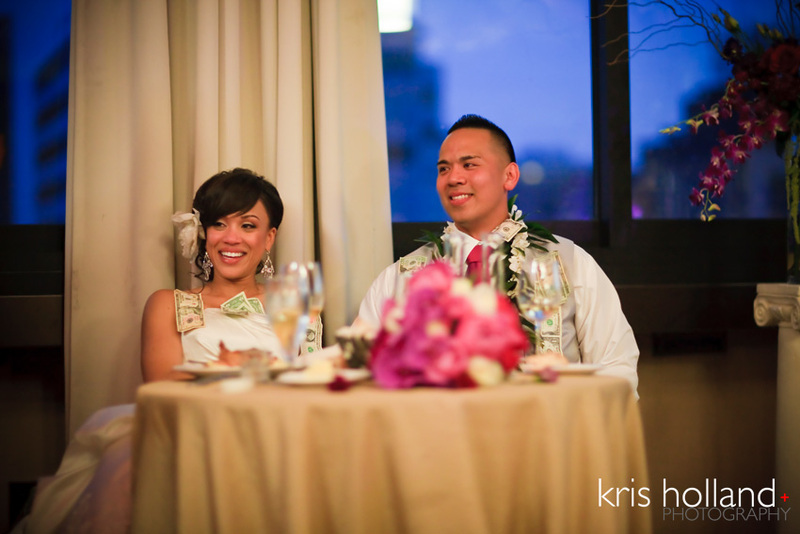 This beautiful wedding was full of personal touches, and we loved their elegant flower leis! With just over 100 guests, this wedding started and ended on the Metropolitan terrace, with a ballroom cocktail hour in between the ceremony and reception. Thank you Jacqueline for the beautiful photos! Congratulations to Marika and Gable, married on February 26, 2011 at The Citizen Hotel! We love these balcony shots captured by Eric James Photography. What a stunning view to accompany a stunning couple! Thank you for the photos Eric! Congratulations to Kristyn and Charlie, married September 18, 2010 at The Citizen Hotel! We have seen a lot of fun weddings in our day. In fact, we might be as biased to say that every wedding at The Citizen is a fun one. But THIS wedding? This might be the MOST fun wedding ever to take place on our 7th floor terrace. We couldn't help but smile looking through these pictures. Where did this group learn such awesome dance moves?! Thank you Aaron and Mauricio for these amazing photos!